Wild Glide Galaxy is a galaxy found in World 2 of Super Mario Galaxy 2. The galaxy features a jungle with a river. This galaxy is one of two galaxies involving Fluzzard Gliding. With Fluzzard, the player can burst Balloons with Star Bits and bubbles with Coins. There are no enemies in this galaxy. Fluzzard and Jibberjays in the Starting Area. This is a small platform high above the Race Area. Several Jibberjays and Fluzzard are found here before the race begins. This Planet is covered in a tropical forest. The missions in this galaxy start with Mario landing on an area with the Jibberjays and Fluzzard. When the race begins, Mario will be gliding on Fluzzard though out the course of the forest. This race has a river and a waterfall, balloons which Mario can pop to get star bits, and bubbles contain coins. Near the end is the Comet Medal which Mario can fly right through to pick up after passing through five gates that look like comets found throughout the planet. Once Mario passes the finish line, he will be transported back to the starting area. This mission's objective is to cross the sun gate with Fluzzard. 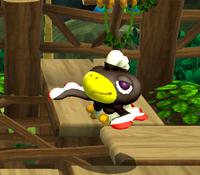 This mission's objective is to beat the Black Jibberjay in a race. Mario and Fluzzard nose-diving toward the first Green Star. The second Green Star is in sight. There is a wall with two holes, one with a 1-Up Mushroom, and another at the bottom that the river flows through. The first Green Star is found at the bottom hole. The second Green Star is located on the tip of a mountain near the end of the course. After exiting the cave area, the player must fly to the right and carefully aim for the star. Wild Glide Galaxy - Music when gliding with Fluzzard. The music is a remix of the theme from the Sky Station Galaxy mission Peewee Piranha's Temper Tantrum. French (NOE) Araplane tropical Tropical Araplane (Araplane being the French name of Fluzzard). This page was last edited on November 21, 2018, at 06:50.